We want to hear from you: Call me, Melissa Poole at 678-920-4557. The links below work. Join us. Tell us what you think about our organization, our events, our website or anything else that comes to mind. Tell the world that you are a member by providing a link to us from your website! Not only does it inform your website visitors about your membership with us, it can potentially increase your placement in various search engines. If you are a member, we also return the favor in your member's listing when you provide your web address on your registration form. To add the DBA logo to your website, copy the HTML code below and paste it into the HTML code on the desired web page of your site. The logo is 130 x 140 pixel. QR Codes (Quick Response) is becoming increasingly popular now days and growing very quickly in the technology market. Many smart phones like the Androids and iPhones have Apps that are able to read these weird blocks. 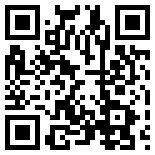 If you have a smart phone with the ability to read QR codes, scan the image below and see what happens.